For the past 45 years, my husband and I have been raising beef cattle on a small mountain ranch in Idaho. Our animals have been the primary focus of our life work, especially during calving time. 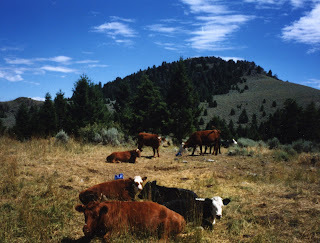 For many years Lynn and I had about 170 cows, pasturing them on Bureau of Land Management (BLM) range in the mountains during summer while we are growing hay on our ranch meadows (to feed the cows in the winter). Our winters are long — we feed hay 5 to 6 months of the year — so growing hay is an important part of the operation. And the cows must be eating somewhere while we are growing hay on our “home acres,” so they spend the summer on the mountains surrounding our little ranch, on our BLM range pastures. and calves are relaxing at midday at a salt ground after grazing all morning. We raised a few horses to ride in the mountains to look after the cattle, and until recent years we were riding daily to check on the fences (trees sometimes blow over and flatten them, elk sometimes knock them down), water troughs (to make sure they keep working), gates (to make sure they stay shut so cattle stay in the proper pastures), and the cattle. If we were checking them every day, we knew whether or not there were any problems — such as a cow with pinkeye or foot rot or a sick calf that we might need to bring home to doctor. The haying was a full-time job in the summer, and so was the range riding, so my husband did most of the haying and I did most of the range riding; that way we managed to get it all done. 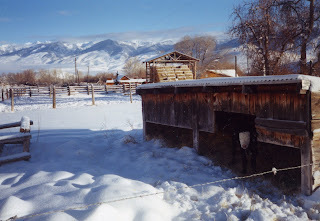 I also did a lot of writing about cattle and horses, primarily as a means to help pay the bills so we could keep ranching and raising cattle and horses. Even though I enjoy writing, being a caretaker of the land and its animals is the more satisfying and purposeful focus for my life; it gives me a meaningful reason for my existence, and I feel in tune with the world and with myself. nearly 25 years old and our grandkids enjoy riding him). Ranching is a hard life. We have fewer cows now and less work, but during most of the past 45 years, some times of year we were working nearly 24 hours a day, and our time was never really our own — we were servants to our animals. Out of necessity it’s a very frugal life but rich in intangible ways, and I would never have traded it for any other. 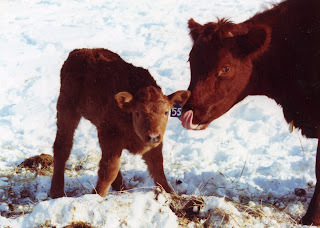 Calving season was our most difficult time of year and yet a very emotionally rewarding experience. We calved in January for a long time, a month when temperatures can be subzero, making it necessary to put every cow into the barn to calve and crucial that we be present for every birth. 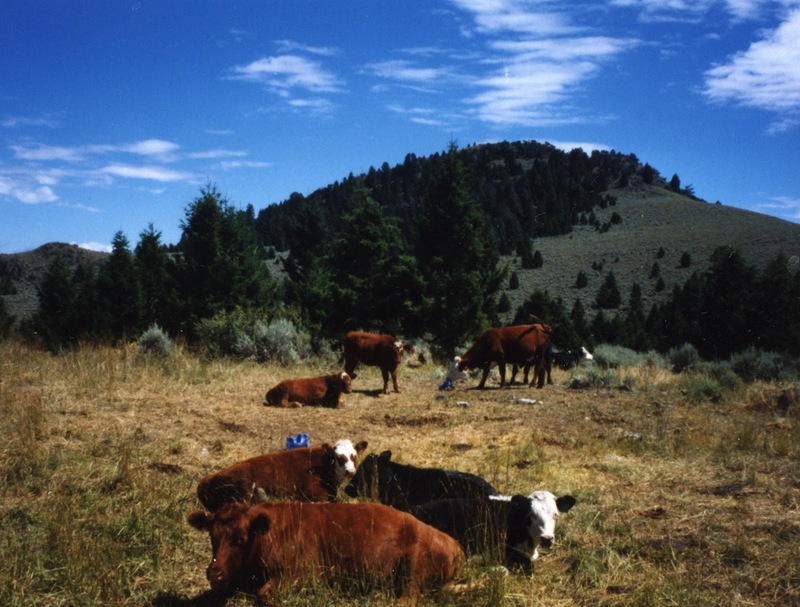 It would be easier in many ways to calve in late spring or early summer when weather is nice, but for us it wouldn't work because our ranch depended on public land for summer pasture. 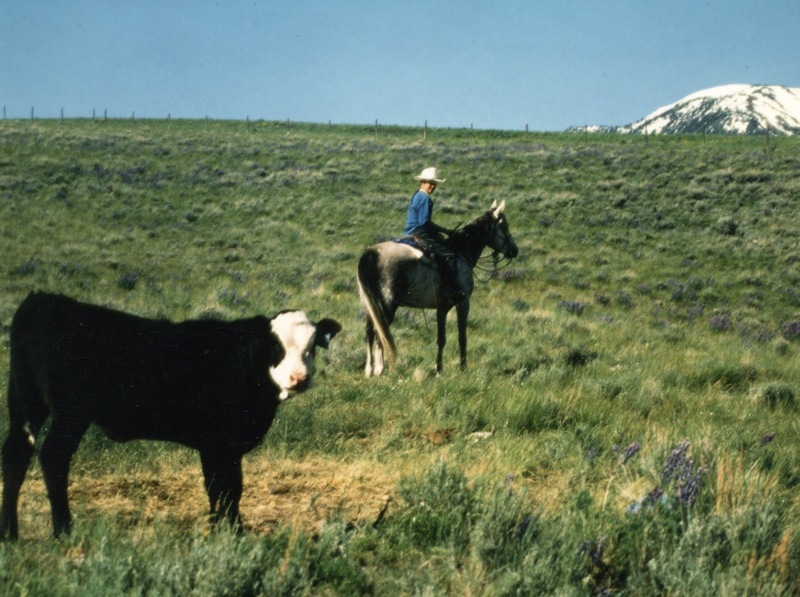 We needed to have calves born early so the cows could be rebred to our own bulls before going to summer range in the mountains (to breed the cattle selectively, mating each cow to a bull we choose for her, to keep genetically improving our cattle). Also, the cows bred up quickly on our small “home” pastures, compared to the long, strung-out breeding and calving season that occurs when cattle are bred in huge pastures where they are more scattered and the bulls may not always be with them at the appropriate time. 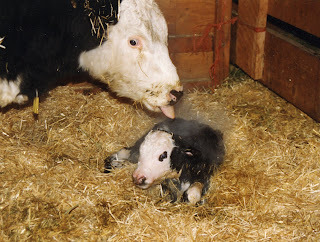 mama is tentatively licking her new baby, who is still "steaming" wet from birth. Early calving also has other advantages. The ground is frozen in January, and young calves don't get sick as much as when weather is wet and sloppy (as in the mud and storms of March and April, the traditional calving season in our region), so we didn't have to doctor as many calves and rarely lost any from sickness. Also in January we were not busy doing spring work (fencing, farming, and irrigating) and could devote all our time to calving. Most years we had no birth losses, because we were there at the right time to correct any problems. much healthier than in muddy, wet weather when scour "bugs" flourish. But living with the cows 24 hours a day is a physical challenge! My husband and I used to do it all by ourselves, and then for a while our daughter and her husband helped with the “night patrol” [until our daughter was seriously injured in a range fire in July 2000 — and that changed everything; I told about this life-changing experience in my book Beyond the Flames: A Family Touched by Fire, and more can be read about this “detour” in our lives on my personal blog at www.heathersmiththomas.blogspot.com. 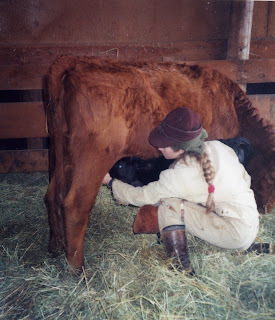 Whenever a cow goes into labor, we put her into the barn to calve. 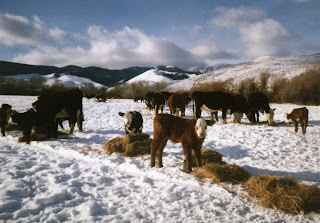 One benefit of breeding our cows before they went to summer range was that our calving season was short and fast. The cows were due to start calving January 2 (which meant we had to be ready any time after Christmas because a few always calve a bit ahead of their due dates), and the last ones were due in early February. Three-fourths of the babies arrive in the first 3 weeks, and often we had 10 to 20 calves in any given 24-hour period. So calving was often a sleepless marathon during the peak of it. come out to nurse their mothers and then go back inside. “We are practically living with the cows, walking through them once an hour during the night (and even more often if weather is very cold, to make sure we don't have any calves born outside before we can get the cow into the barn). 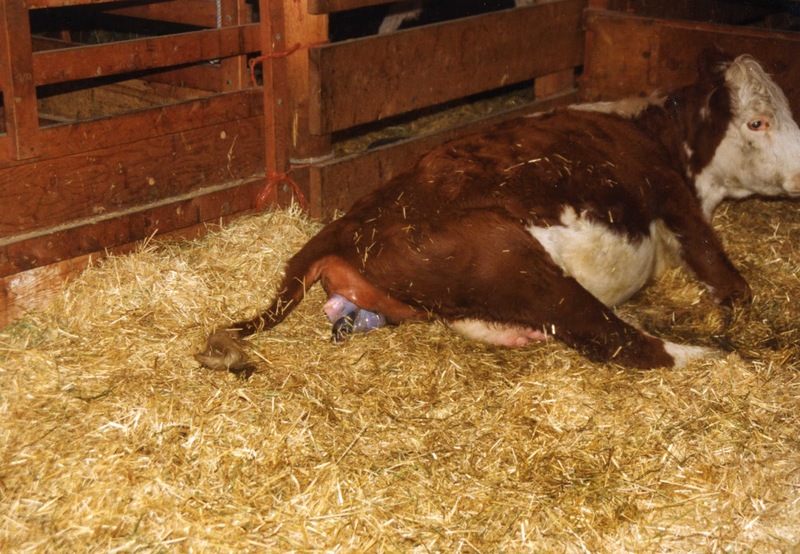 Whenever a cow goes into labor, we put her into the barn to calve. “It's a tough time of year but a very satisfying one. We enjoy our cattle and being with them, working outdoors hand in hand with Mother Nature, helping her with a difficult birth or a sick calf, fighting her sometimes when weather is bad and we’re trying to provide shelter for newborn calves (as during the first week in February 1989 when the “Siberian Express” blizzard conditions and fierce wind made it equivalent to 100 degrees below zero F.). It's a tremendous physical effort. was part of our job if the calf was slow to get started in cold weather. “Yet calving season is my favorite time of year. It gives me the perfect excuse to be truly an outdoor person. I try to be outdoors all times of year, yet there are always a few other commitments and responsibilities (even my writing) that can interfere. But at calving time the other responsibilities take second place and are far out of mind. The housekeeping is neglected, the cooking bare minimum, and I don't go to any meetings or see people. I don't go to town at all. From Christmas until late February, I live with my cows, getting the calves safely born and off to a good start in life — making sure any sick ones get doctored at the first hint of illness. My husband or our daughter make a fast trip to town occasionally for groceries and mail, but I stay home and look after the cows and babies. This is my time to be a hermit, in tune with the “real world” of Mother Nature's domain. “And though it is stressful, working almost continually without sleep for several weeks, calving time refreshes my spirit. Helping a heifer calve, guiding a blundering baby to the udder for its first nursing, walking through the cows at night and listening to a pair of courting Great Horned owls hoo-hoo-hooing in the trees next to the "maternity ward" — this is my time of peace. I feel at one with the whole universe on a cold, still night when the ice crystals are sifting down through the glow from the yard light, listening to coyotes yapping on the hillside above the house. These and a hundred other little things are all a part of calving time. They make me feel good about being a caretaker of animals and spending my days and my nights with them. and hurry of modern life and to immerse myself in the peaceful pace of nature. “There's something very natural and primordial about working with animals and nature. It's part of our human heritage from the beginning of time. The rancher, the hunter, the outdoor person who likes to get out into the woods to “experience” nature — we all feel this pull, this kinship with the earth that nurtures us and with her creatures that coexist with us and sustain us. When humans get too far away from their roots and their place in the scheme of things, they become ill at ease, restless — sometimes even emotionally disturbed. City life is artificial and unnatural. In the history of mankind, people never lived together in such large clusters until recent times, and we are still trying to learn how to cope with this unnatural existence. “I'm sure this is why so many of us strive to get away from the rush and shove of civilization at times, to get ourselves back into perspective and more in tune with our purpose for existence. We need to feel we're a part of nature, rather than alienated from what is real and enduring. This is why modern man needs natural areas to escape to — fields and forests, deserts and mountains, rivers and lakes — open spaces away from the human traffic and concrete jungle. We need to find a place where time still moves in eons instead of by a workday clock and where Mother Nature still calls the shots. 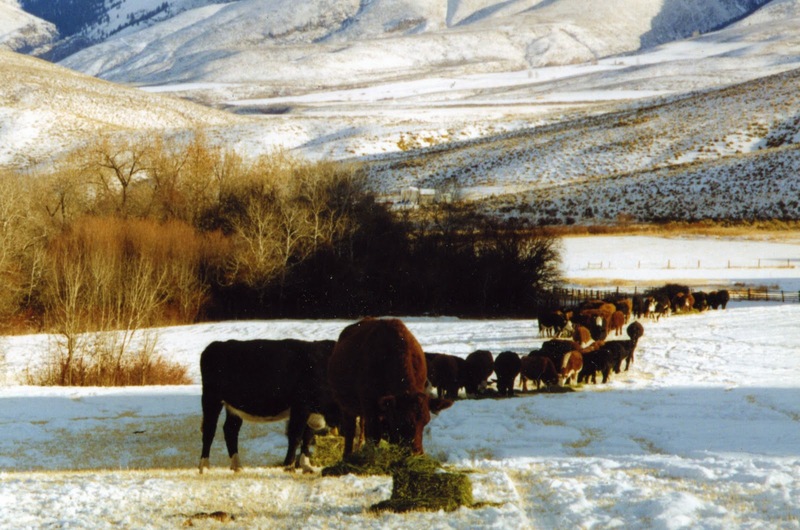 Feeding our cattle, tending to their needs, is a satisfying way of life. “It is this seeking for our roots and our very reality that makes us outdoor people — hunters or birdwatchers, nature lovers or animal caretakers. It is this loyalty to Mother Earth and a feeling of kinship with other creatures that makes us recognize the value of natural things and spurs us to be concerned with trying to keep the earth and her creatures healthy. “It makes us want to manage our fields and forests, our wild game herds, our livestock — all in a balance that will perpetuate the abundance and health of the earth and its ecosystems and provide for us humans for generations to come. When we care about nature, we practice good husbandry, using the bounty of earth (harvesting it as crops or meat for our sustenance or timber to build our homes) while doing so in a way that ensures continued bounty in the future: healthy game herds in balance with habitat, flourishing grasslands and forests, fertile productive fields, healthy crops and livestock. We strive to keep the world a place where nature can continue to provide beauty and plenty for ourselves and our children and grandchildren. important in life; I am content to be a caretaker of cattle. “Maybe these thoughts are simplistic and idealistic, but they are part of how I feel about nature — the earth and its animals — and our part in it all, as I immerse myself in our calving season and become for a time “outside of time,” focusing all my awareness and energy into getting new babies safely born, warm and dry, nourished and healthy. Feeding my cows, tending to all their needs and meeting the challenges that arise during calving is truly satisfying and helps me get my priorities back into proper order. 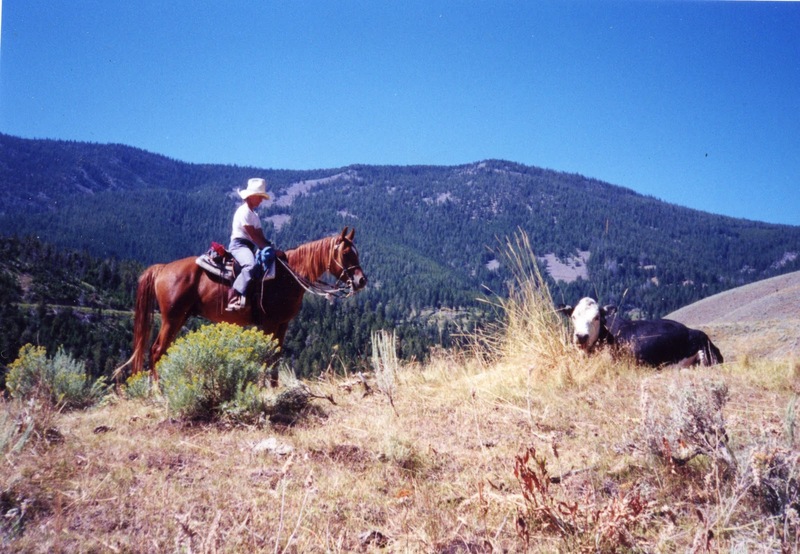 Heather Smith Thomas raises horses and cattle on her family ranch in Salmon, Idaho. She writes for numerous horse magazines and is the author of several books on horses and cattle farming, including Storey’s Guide to Raising Horses, Storey's Guide to Training Horses, Stable Smarts, The Horse Conformation Handbook, Your Calf, Getting Started with Beef and Dairy Cattle, Storey's Guide to Raising Beef Cattle, Essential Guide to Calving, and The Cattle Health Handbook. You can read all her Notes from Sky Range Ranch posts here. What do you do with your male calves? Regarding the question about what we do with our male calves: We keep a few of the best ones for use as bulls (for ourselves or for our son's herd) and castrate the rest — to sell in the fall as steers.